Assistant Professor Kunal Mankodiya demonstrates his smart glove technology, which provides a user-friendly way for people with Parkinson’s disease to monitor symptoms and send the information to their doctors. Along with his research, Mankodiya is an active supporter of initiatives such as the annual “HealthHacks” design competition at URI to help students build their creative and entrepreneurial skills. Kunal Mankodiya is a collaborator, a team leader, a people person. 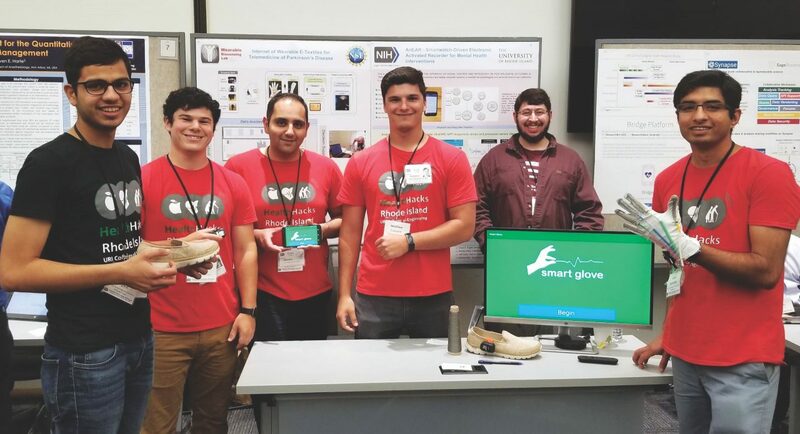 Mankodiya and his students are developing wearable technology to monitor, treat, and help people with Parkinson’s and other medical conditions. Much of what they’re doing is unique, but perhaps the most notable thing about this team is that it is as focused on the people it’s designing for as it is on the technology itself. For a cricket team, you need 11 players. This was a typical problem on Kunal Mankodiya’s mind as a teenager in the small town of Dhrangadhra, India, where as a team captain, he spent much of his free time going door-to-door rounding up enough players and strategizing how to use everyone’s strengths on the field. He never imagined a future in research, though he was a good student. Off the field, he frequently helped out at his family’s business, a clothing and textiles store in town. When it came time to apply to universities, Mankodiya’s curiosity was piqued by an unusual major in one course catalog—biomedical engineering—not only because he wasn’t sure what it was (“it was before Google,” he recalls), but also because there was only one university that offered it. “I figured it must be something new,” he says. The three seem unrelated: cricket, a clothing store, biomedical engineering. For Mankodiya, a College of Engineering assistant professor who is breaking new ground in wearable technologies, they are interconnected keys to his success. He remembers the morning inspiration struck. Over a cup of chai, Mankodiya was thinking about a smartwatch app he had developed with a neurologist during his postdoc research. Designed to help monitor the symptoms of Parkinson’s disease, a nervous system disorder that causes the progressive deterioration of motor function, the watch had potential for Parkinson’s treatment, but ultimately wasn’t ideal for capturing the data needed. As he sipped his chai, Mankodiya’s mind drifted to another past collaboration—a heart-monitoring belt he had developed while earning his Ph.D. at University of Lübeck in Germany. The belt had been designed to measure the heart’s electrical activity, an at-home electrocardiogram of sorts. It provided a more accurate reading than an in-office stress test—where a patient’s anxiety might skew results—and also could monitor heart activity over a prolonged period of time. 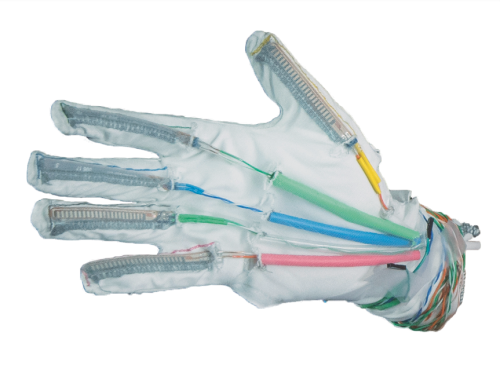 Mankodiya envisioned that a smart glove could enable patients to perform some of these tests at home, with a tablet or phone app to record data for their doctor to view remotely. Mankodiya’s smart textiles connect to a digital app, which can be viewed on a phone or tablet, that records information for a doctor to review remotely. Icons on the app (pictured) indicate exercises such as finger tapping, fist opening and closing, hand flipping, and finger pointing that the wearer performs to measure movement and other indicators that help the doctor monitor how well a treatment plan is working. The neurologists are key players on an impressive team. URI faculty in engineering, textile design, kinesiology, nursing, and the Ryan Institute for Neuroscience, and specialists and organizations outside URI are among the lab’s collaborators on various in-the-works or upcoming projects. Among them: smart shoes to help detect gait abnormality linked to dementia, wearables for stroke rehab, and even mattress toppers for sleep monitoring. But the collaborators always foremost on Mankodiya’s mind are the people who will use the wearables and the students at the heart of his work. The Wearable Biosensing Lab was invited to speak at the National Institutes of Health mHealth Tech Showcase last June. Pictured (left to right): visiting student Sahil Kargwal (Indian Institute of Technology Delhi, India), Nick Constant ’15, Mohammadreza Abtahi, M.S. ’14, Matt Constant ’18, Josh Gyllinsky, M.S. ’18, and Kunal Mankodiya. Right now, the glove is a poly-cotton blend. Neoprene might work better, Mankodiya notes, ever experimenting. Comfort and flexibility are only two of the design considerations behind a wearable, which must deliver precise results consistently. Some wearables require delicate sensors; others must withstand pressure. Placement is key, as is stability. Hygiene is a factor—the textile will require frequent use and ultimately multiple users. “Each human is different, each hand or foot is unique,” says Mankodiya. “You need to create something that is personalized, yet is also for many people.” Above all, it must be something the wearer will want to use. “Each human is different, each hand or foot is unique,” says Mankodiya. “You need to create something that is personalized, yet is also for many people.” Above all, it must be something the wearer will want to use.